It's time for French Country Fridays again! We have a good mix of ideas and inspiration this week from moss pumpkins to a newly released book and so much more. 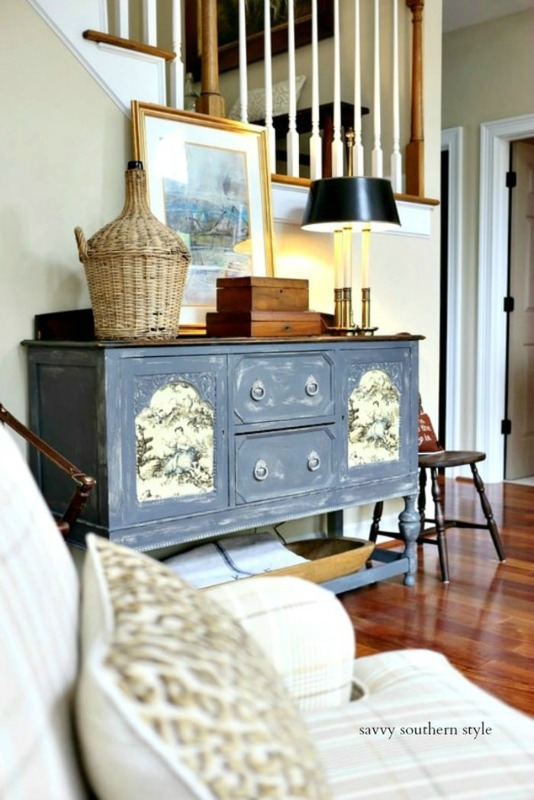 I dug into my archives and pulled out a post I shared about changing up this antique sideboard with toile a few years ago. Sorry I don't have that piece anymore. So grab you a drink and snack and enjoy all the inspiration below. I always enjoy French Country Fridays. Have a wonderful weekend, Kim! Happy Friday Kim...always a pleasure seeing all of the French Country inspiration here! Have a most wonderful and well deserved trip! Congratulations to Courtney! She is such an inspiration! love all your inspiration this week. have a great trip. can t wait to see pics and hear about your wonderful time!